The first weekend of 2018 focuses on teams fighting to beat the drop in National Two North and with only 12 points separating the bottom six, a winning habit must be found for teams at the wrong end of the table. 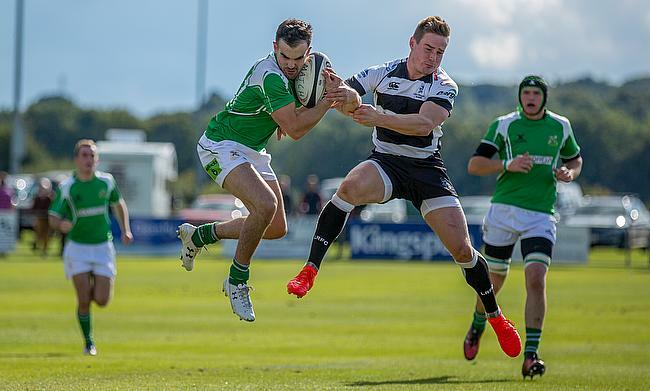 Four of those sides down at the foot of the division take on one another this weekend as Wharfedale entertain Luctonians and Macclesfield take the trip to Blaydon. Otley and Sheffield are the other two teams embroiled in a relegation scrap and both are on their travels – against Chester and Stourbridge respectively – as they aim to continue their recent good form. At the top, league leaders Hinckley travel to local rivals Leicester Lions eager to kick off the New Year at the summit of this division while promotion chasers Sale FC go to Sheffield Tigers, Tynedale take the trip to Huddersfield and Sedgley Park host South Leicester. It was quite a first half of the season for Hinckley. The side promoted to National Two North in 2016 has made remarkable strides in this division and as we begin 2018, the Midlands club currently sit four points clear at the summit. George Chuter’s men have negotiated many hurdles to reach the top of the table so far, but January could really prove whether Hinckley are the real deal. Fixtures against promotion chasing Sale FC and Sedgley Park as well as South Leicester and Sheffield Tigers provide a tough opening month for the Hornets, but they kick-off the New Year with a tricky trip to local rivals Leicester Lions. Sale FC enter the second half of the campaign in fine fettle. The men from Heywood Road currently sit second in the table – just four points behind Hinckley – but they do have a game in hand over the league leaders. A run of eight straight wins for last year’s play-off finalists has put them firmly in the mix for another shot at promotion, but they must keep their excellent run of form going if they are to capitalise on any Hinckley errors. However, Jonathan Keep’s side will be focused on the here and now rather than the bigger picture as Sale begin 2018 with a trip to Sheffield Tigers. The hosts may well have wanted to slam the door behind them at the end of 2017 as they kick-off the New Year having lost their last five games and they are without a win since the start of November. In truth, it has been a pretty solid season for the Tigers considering they pulled off a remarkable escape from relegation last term, but they will be itching to stop the rot this weekend as they aim to inflict a first defeat on Sale for three months. Third placed Tynedale would have been pleased to return to action before the Christmas break following two successive weeks of postponements in December. Scott Lawson’s side came from behind to beat near neighbours Blaydon in their final game of 2017 which means Tyne begin the New Year on a five match winning streak and they are still firmly in the frame for a promotion challenge. The northeast side are currently six points off Hinckley, but they do have two games in hand. Win both of their fixtures against Stourbridge and Wharfedale and Tynedale would move to the summit of National Two North, but their first priority is passing a tough test against Huddersfield this weekend. Gareth Lewis’ men had a superb first half of the season back in National Two North and even though they were heavily beaten by Hinckley just before the festive interlude, the Yorkshire side will be delighted with their seventh place standing in table at the moment. Field have lost just once at Lockwood Park this term and they have also won four of their last five fixtures so they may well fancy their chances of becoming the first side to beat Tynedale since October. It really was a mixed first half of the season for Stourbridge. Nine straight victories to begin the season saw Neil Mitchell’s men deservedly sit at the summit, but a run of no win in four matches leading up to December saw their good start fade away. However, the Midlands club showed great character before the Christmas break as back to back victories against Macclesfield and Luctonians means they are still very much in contention for a top two finish. Stour are currently fourth in the table and just two points off second placed Sale FC (having played the same amount of matches) and a third straight victory this weekend would keep the men from Stourton Park firmly in the hunt. However, they cannot afford to take their opponents lightly on Saturday as Sheffield head to the Midlands in a confident mood. Three wins from their last four matches has seen the Yorkshire outfit move to within four points of safety as they currently occupy 15th place in the division. The men from Abbeydale Road were promoted into National Two North last April and they have now given themselves a wonderful chance of avoiding an immediate relegation back to the fifth tier. Another positive outcome against Stourbridge this weekend could see them move out of the bottom three for the first time since September. It is fifth against sixth in National Two North this weekend as Sedgley Park welcome South Leicester to Park Lane. Matt Bebbington and his side would have been frustrated with the way Sedge ended 2017 as just one win from their final three matches means the Tigers have just dropped back slightly in the race for promotion. Sedge are now five points behind the top two places, but a seventh straight home victory of the campaign would definitely keep them amongst the chasing pack. Sedge have won all of their fixtures at Park Lane this term so this will be a tough assignment for South Leicester this weekend. Over the last few months, the visitors’ form can only be described as patchy, but despite their inconsistences, the Midlands club are having another strong campaign at this level. South have won five of their last nine matches and after a 47-37 victory over Sedge back in September, they will be hoping for a similar outcome to kick-off 2018. After securing a superb victory over league leaders Hinckley in December, a defeat to Macclesfield in their final game before Christmas must have been bitterly disappointing for Chester. In a way, those two results sum up the Cheshire side’s recent form and they will be aiming to try and find some positive consistency as the beginning of 2018. This is a request to anybody out there who loves @OtleyRugby rugby,if you were their today,surely you could see the effort the boys put in,and how much that win meant,don’t sit on the fence,get down every week,the boys appreciate the support. The men from Hare Lane host Otley this Saturday having won just three of their last nine games – which leaves them 10th in the table – while the visitors are now just five points off Chester heading into Round 17. Three victories from their four matches last month has seen the Yorkshire side move out and away from the relegation zone and with spirits high, Peter Clegg’s side may fancy their chances of carrying on their good form in the New Year. If you had asked followers of National Two North at the start of the season, not many would have said that Blaydon v Macclesfield at the beginning of January would be a vital fixture at the wrong end of the table. Both sides were relegated from National One last April and both have really struggled back in the fourth tier of English rugby. Blaydon are currently 12th in the table and four points clear of the drop following just one win in their last seven matches, but they have the chance to put a tough 2017 behind them this weekend. As for Macclesfield, they are one place and one point behind their, but they did enter the Christmas break on the back off an excellent win over Chester. That was Macc’s first win since October and a maiden victory for interim Head Coach Marshall Gadd so he and his Blues squad will be aiming to build on their Cheshire derby triumph by claiming another victory in the northeast. Luctonians Head Coach Ryan Watkins admitted this week that he is confident that his side can end their wretched run of form sooner rather than later. The Lucts head into this vital match with Wharfedale having lost their last 10 games and despite some improved performances over the last couple of months, the men from Mortimer Park have struggled to turn some of those displays into victories. The Kingsland outfit currently sit three points from safety after dropping into the bottom three just before Christmas, but they have an excellent chance to begin the New Year with victory over Wharfedale. As things stand, Dale are propping up National Two North but they are only nine points from climbing out of the danger zone. Recent performances, including their second win of the season against South Leicester, have given James Doherty’s side hope and victory over a relegation rival this weekend could be the spark for a revival.